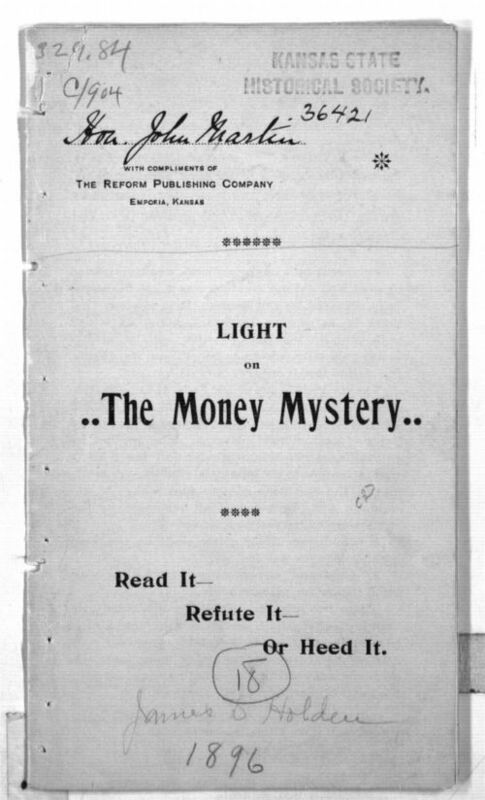 James D. Holden of Emporia, Lyon County, wrote this pamphlet to propose his solutions to the money problem raised by Populists. He takes the solution further than the unlimited coinage of silver, arguing that the value of land should also be used as a source of money, in addition to precious metals (gold and silver). He believed this would do away with the need to pay interest, which would increase the wealth of everyone. This source would best serve students when excerpted. The conclusions that Holden makes (which begin on page 7) list the Populists' guiding assumptions about the coinage of money. The section beginning on page 6, titled "What is the Remedy?" explains what steps the Populists hope the nation will take.